The Oregon Wine Blog: The Palm Springs of Washington! I too had to have the Masterpiece from Kana. Coincidence? No, it's just that good. How much better does it get? Also you can take advantage of our newly implemented "Cork Free Zone" Buy a bottle of our wine take it to dinner, uncorking fee is waived, as a thank you for supporting Yakima in town wineries and restaurants! I will be at hte the Northwest Food & Wine Fetival Saturday night, I hope run into you! Hi! My name is Ben Grossman and I am the Winemaker for Kana. Thank you for the kind comments about the 2007 Masterpiece...some people get the complexity while others do not. It is especially a nice wine to open and 'let open' i.e. breathe. The longer you let the wine open up, the more it evolves. Usually you get a wine and it pretty much is what it is...not with this one. Try the experiment and see if you find the same results. Please let me know when you are in town if you would like to know more about how the wines were produced. Hey great post! My wife and I have been to the Yakima area twice for wine tastings and definitly need to return. Of all of our bottles we bought - we also enjoyed the Kana bottle the most. Kept it for reference it was a Zinfindel (rare for WA). Nice post about Yakima and two of my favorite downtown wineries. 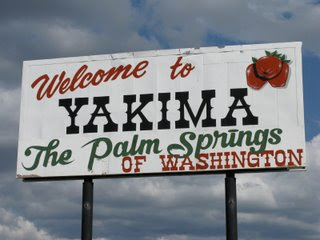 Although I've never been to Palm Springs, I hope there is a sign there that says, "The Yakima of California!". I've been in Yakima about 18 months and have been to about 150 wineries, mostly in the Yakima Valley to Tri Cities corridor wide side trips to the Gorge, Oregon, Lake Chelan and Walla Walla thrown in. Lots of great stuff here so why venture anywhere else. A few recommendations for Yakima and close by. Tim's Tasting room downtown has Upland Estates wines, a newer estate winery for one of the oldest vineyards in the state. Other favorites are Masset and Severino in Zillah, Steppe in Sunnyside, Milbrandt and Alexandria Nicole in Prosser.